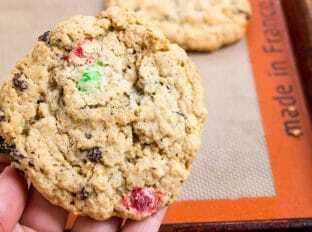 These Super Chewy Oatmeal Raisin M&M Cookies are full of oats, raisins, M&Ms, brown sugar (this makes them super moist and chewy) and they stay fresh covered for a week…if they last that long!I can’t believe it is almost Christmas!! We’ve got our tree up, the house is totally decorated and these cookies have been prepped for their debut. These Super Chewy Oatmeal Raisin M&M Cookies are actually part of our Christmas Eve tradition so I only use red and green M&Ms to stay in the holiday spirit. We call them “Reindeer Cookies” and pair them with the Jacques Torres Chocolate Chip Cookies for Santa. Our plates consist of one chocolate chip and 8 reindeer cookies (you know, since Santa has 8 reindeer?). While these cookies look substantial, for the plate I make the ones for the reindeer significantly smaller (1 tablespoon of cookie dough instead of 4) so Santa and his helper can finish them off in short order! To prevent myself from being in the kitchen cooking on Christmas Eve, I actually made both batches of cookies a couple of weeks ago and froze the dough in balls. So now I just pop them into the oven and they are fresh and ready to go! 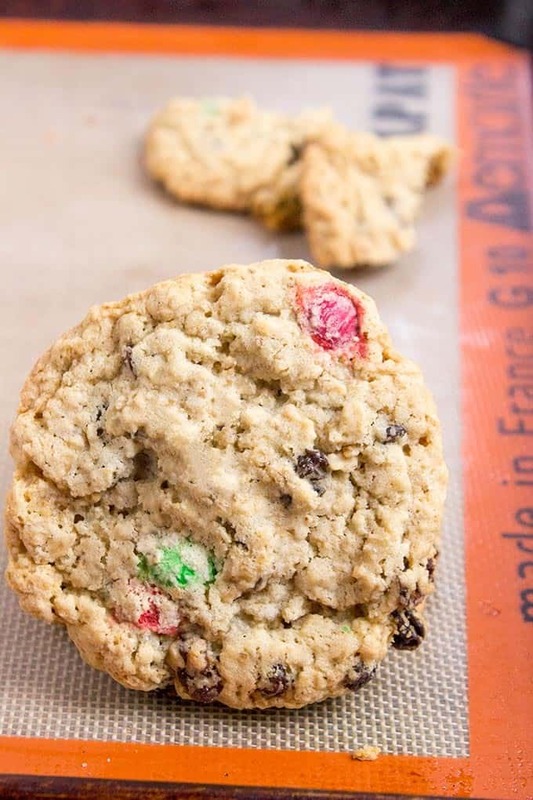 The Super Chewy Oatmeal Raisin M&M Cookies (I have to keep referring to them as super chewy, they are magical) are full of awesome mix-ins but my favorite addition is the dark brown sugar which makes them super rich, moist and chewy. When I was recipe testing them a couple of years ago I ended up making 4 or 5 batches which left me with a ton of cookies. They kept fresh (and by fresh I mean chewy, most and not at all crumbly) for OVER a week! This recipe was such a hit I actually made it my base for my basic oatmeal raisin cookies and my oatmeal peanut butter cookies too. 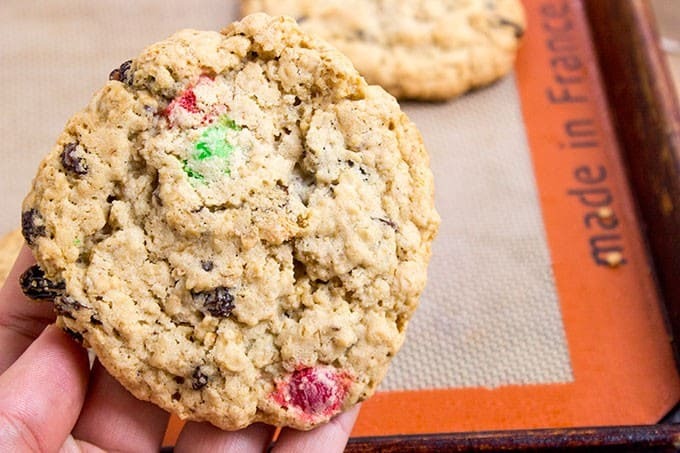 Super Chewy Oatmeal Raisin M&M Cookies are full of oats, raisins, M&Ms, brown sugar (this makes them super moist and chewy) and they stay fresh covered for a week...if they last that long! 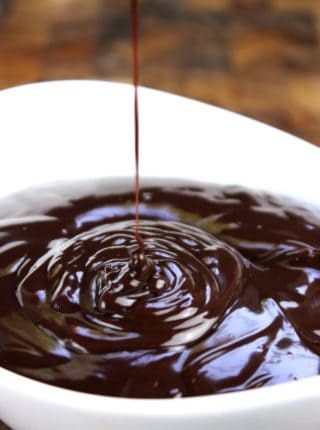 In a medium bowl whisk together the flour, baking soda, baking powder and kosher salt. 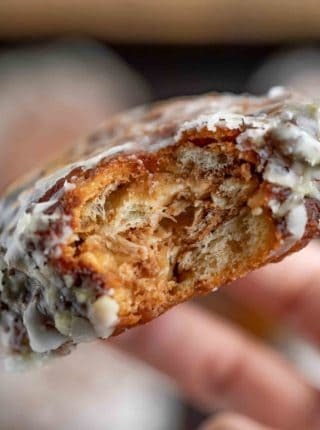 In your stand mixer cream the butter and sugar for 1-2 minutes on high until light and fluffy. Add in the dark brown sugar, eggs and vanilla and mix until fully combined. Add in the dry ingredients a third of it at a time until just incorporated. Add in the oats, raisins and M&Ms and mix in on low for just a few seconds until combined. Refrigerate your dough for 30 minutes AT LEAST (the longer the better. Depending on the size of the cookies you want, your baking time will vary. For large cookies as pictured, using an ice cream scoop (1/4 cup) drop onto greased pan or using a silpat liner, bake for 12-14 minutes (I get 18 cookies). For medium cookies, using a two tablespoon measure (like a coffee scoop, the one I use is double duty with a 2 tbsp measure on one side and a 1 tbsp measure on the other side) bake for 11-13 minutes (I get 36 cookies). For small cookies, using a 1 tablespoon measure, bake for 9-11 minutes (I get 72 cookies). You don't need the cookies to brown too much, so the moment the bottoms get brown, pull them out. Psst, a little behind the scenes? These cookies are one of 3 that will be part of my holiday gifts I give clients this year. Also making the cut are again, the famous Jacques Torres Chocolate Chip Cookies and my Award Winning Gingerbread Cookies. 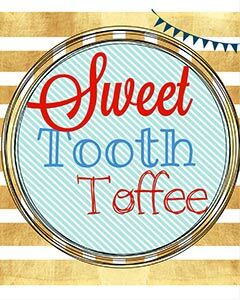 Sweet Tooth Toffee came about just as the name suggests, a crazy late night sweet tooth craving. From there, I thought of all the different sweets I love but can’t put in my purse running errands like cheesecake, pumpkin pie, blueberry cobbler and voilà! 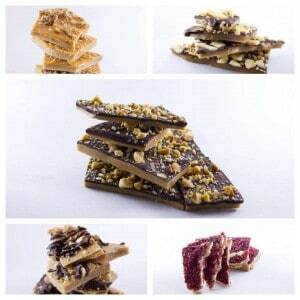 Delicious flavored hand crafted toffee. This cookie has all my favourite things in it. I could eat these all the live long day. i love the size of these cookies. and, they will be a great cookie for my girls upcoming bake sale! Aren’t giant cookies the best thing ever!? Yep! Or you can even just replace the raisins with chocolate chips. I love how these cookies have chocolate in them. My kids love oatmeal raisin cookies, and I like chocolate chip ones. These combine the best of both worlds. Those look super chewy and delicious. I need to make Christmas cookies very soon, so thanks for the recipe. You were cutting it close to the last minute there! I hope your baking session was a successful one! I love oatmeal cookies and these look amazing. Can’t wait to give them a try after the holidays. That makes me almost want to try raisins! I love chocolate chip cookies but I have never tried it this way. You’re after my heart with this extra chewy business. That’s how I love my oatmeal raisin cookies! 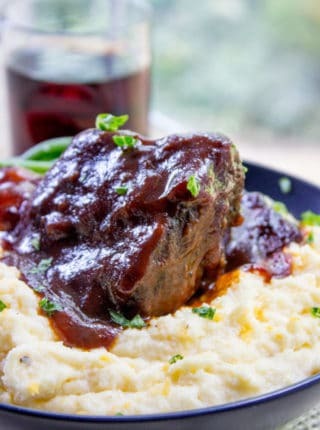 Thank you for share this tips, this recipe looks really amazing, it must be very delicious! Thanks! My family certainly thought they were delicious – I kept returning to the kitchen and finding more and more were missing! These look so yummy! I love that they are chewy, as I perfer a chewy cookie! I really enjoy oatmeal and raisin together in a cookie, too! Oatmeal and raisin were pretty much designed to go together in cookies! These look really good. I love a chewy oatmeal cookie! This would be right up my husband’s and kids’ alley! Oatmeal Raisin cookies are tasty on their own, but adding M&Ms? YUM. It certainly adds a great chocolate flavor to an already great cookie! We love some good cookies in our house and I suspect my boys would adore these. Great tip to make them smaller for Santa and his reindeer. No need to overstuff the jolly man on his Christmas run! The fat man’s got a lot of cookies to plow through already, haha! These look and sound perfect! 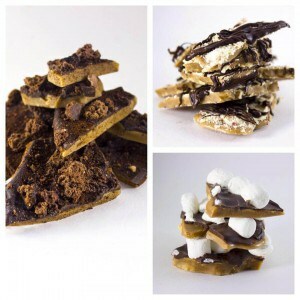 My kids would have a blast helping me make (and eat!) these! Those look incredible! The best part is that they look so chewy! 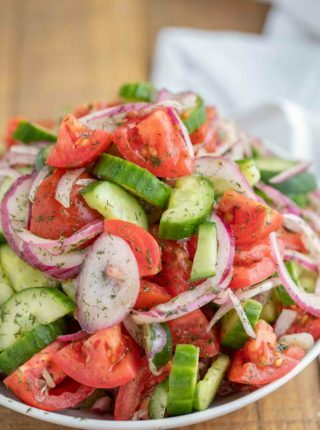 Yummmy! Thanks! We love chewy cookies too! Thanks! I hope you do start the tradition! Those look so good and perfect for Christmas with the red and green m&ms. Plus, these could easily be changed for all the holidays just by changing the colors of the m&ms. That’s exactly what I was thinking! Although, sorting M&Ms can get tedious, so it helps to have a little one sort them for you, even if you lose a couple along the way! I love a chewy oatmeal cookie. This sounds like one I would love. Then this one would be perfect for you! What type of oatmeal do u use for this recipe? ?